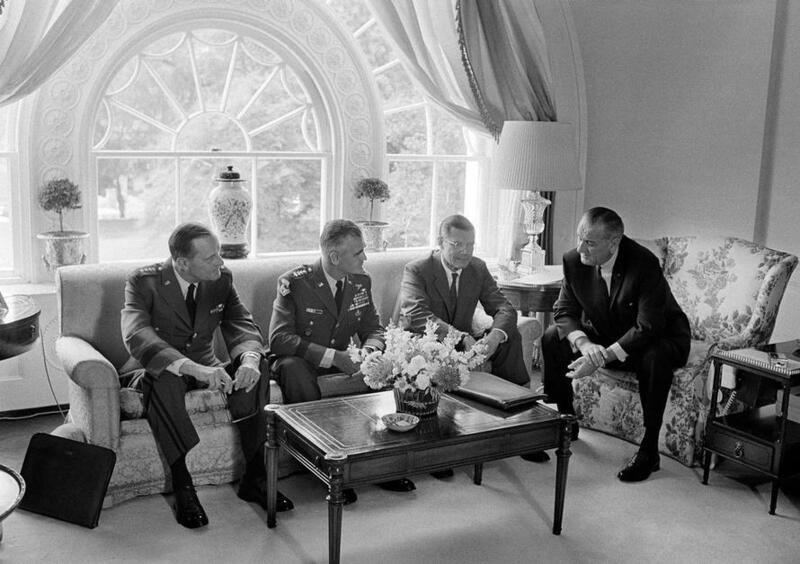 Recently declassified documents from the Vietnam era reveal that the United States' top military commander in Saigon activated a plan in 1968 to place nuclear weapons in South Vietnam, but was overruled by President Lyndon B. Johnson, reports the New York Times. The commander, Gen. William C. Westmoreland, had been preparing the nuclear option in secret - drafting plans to have nuclear weapons on hand in case American forces should find themselves near-defeat in the battle of Khe Sanh - one of the most gruesome battles in the war. 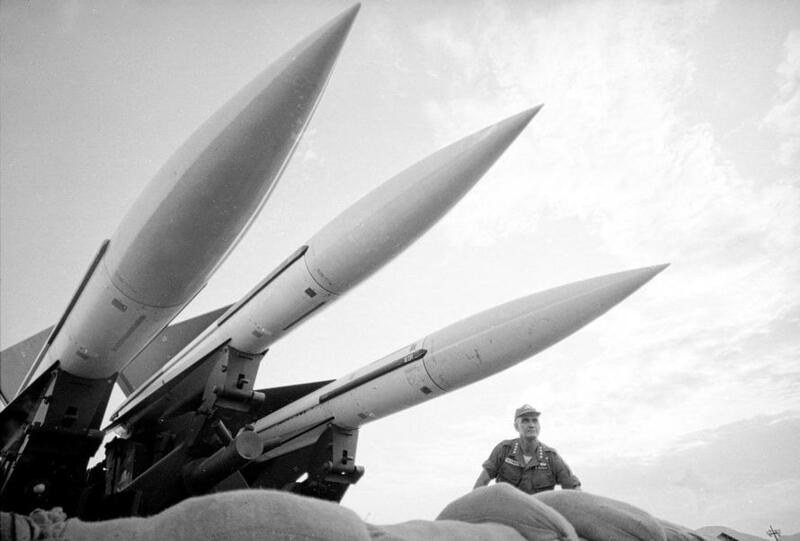 The plan to use nukes, code-named Fracture Jaw, would see nuclear weapons placed in South Vietnam for use on short notice against Vietnamese troops. It was scuttled by LBJ after Johnson's National Security Adviser, Walt Rostow, alerted the president to the plan in a memorandum. The president immediately rejected the plan and ordered a turnaround, according to presidential assistant Tom Johnson, who took notes during the meetings on the issue which were held in the family dining room on the second floor of the White House. "When he learned that the planning had been set in motion, he was extraordinarily upset and forcefully sent word through Rostow, and I think directly to Westmoreland, to shut it down," said Johnson Johnson in an interview, who added that LBJ was greatly concerned over a "wider war" in which Beijing would enter the fray as they had done 18 years prior in Korea. "Johnson never fully trusted his generals," said the former assistant. "He had great admiration for General Westmoreland, but he didn’t want his generals to run the war." Had the weapons been used, it would have added to the horrors of what was one of the most tumultuous and violent years in modern American history. Johnson announced weeks later that he would not run for re-election. The Rev. Dr. Martin Luther King Jr. and Robert F. Kennedy were assassinated shortly thereafter. "Johnson certainly made serious mistakes in waging the Vietnam War," said Breschloss, who discovered the documents while researching for his book. "But we have to thank him for making sure that there was no chance in early 1968 of that tragic conflict going nuclear." Johnson - knowing that the Khe Sanh battle was imminent, pressed his military chiefs to make sure that the United States did not suffer an embarrassing defeat, while the North Vietnamese forces were throwing everything in their arsenal at two regiments of United States Marines and a small number of South Vietnamese troops. And while Gen. Westmoreland publicly expressed confidence that they would win, he was privately organizing a group which would meet in Okinawa to plan how to move nuclear weapons into South Korea - and draw up plans for how they would be strategically used against North Vietnamese forces. Westmoreland's plan did not last long. The same day as his memorandum, Rostow sent an "eyes only" memorandum to LBJ - his second that week - warning of the impending plan. 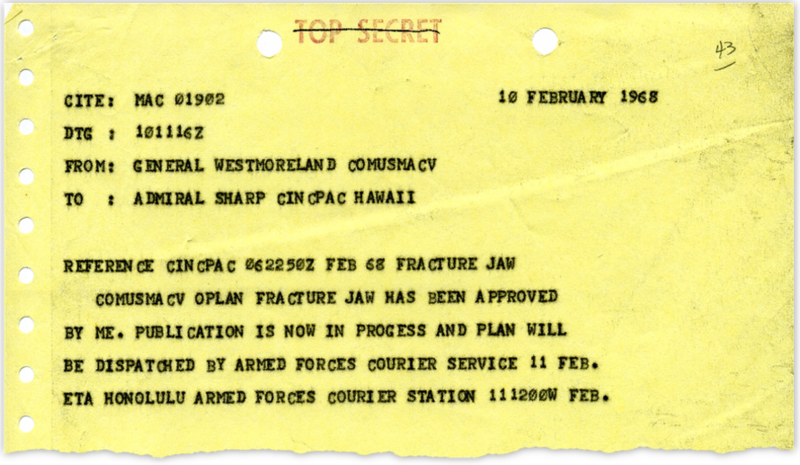 Two days later, Admiral Sharp gave the order to "discontinue all planning for Fracture Jaw" and to place all the planning material, "including messages and correspondence relating thereto, under positive security." Operation Fracture Jaw echoes other moments when US presidents were forced to consider - or bluff - over the use of nuclear weapons, most famously during the 1962 Cuban missile crisis. Prior to that, Gen. Douglas MacArthur explored the use of nuclear weapons in the Korean War, before he was dismissed by President Harry Truman, who feared that MacArthur's aggressive strategy would ignite a broad war with China. At one point he did move atomic warheads to Pacific bases, however, though they were not placed in Korea itself. 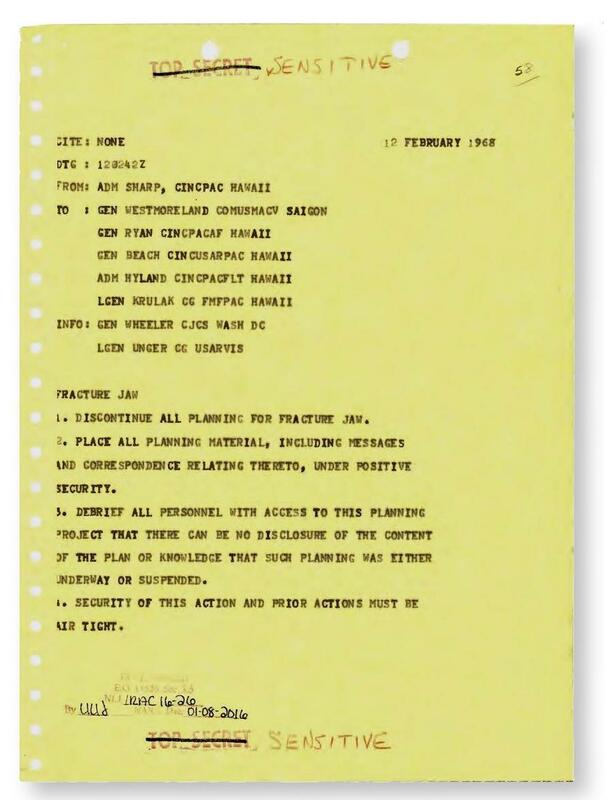 Within four days of Westmoreland's letter, US Pacific commander Admiral Sharp wrote that he had "been briefed on the contingency plan for the employement [sic] of tactical nuclear weapons in the Khe Sanh/DMZ area which was drafted by members of our respective staffs last week in Okinawa." He declared that it was "conceptually sound," and asked for a full plan to be forwarded to him "on an expedited basis so that the necessary supporting plans can be drawn up." 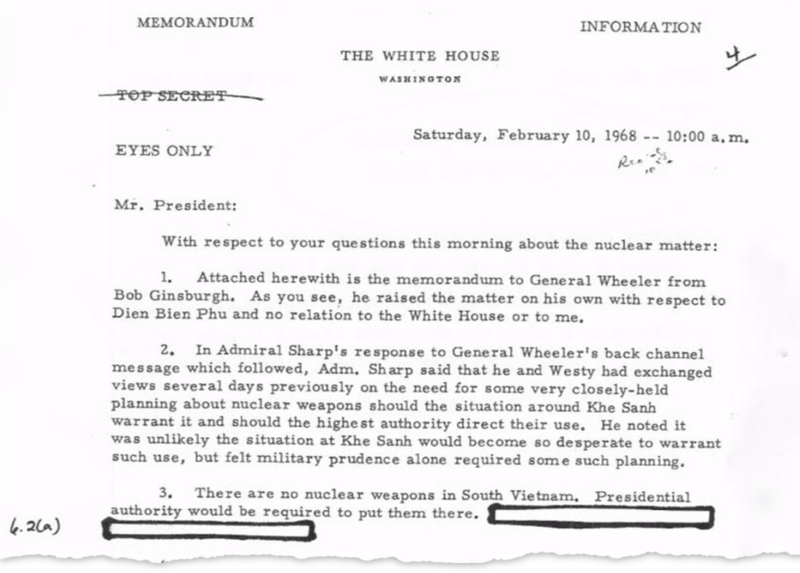 Three days later, Westmoreland wrote back to say that he had approved the plan, while at the White House, Rostow told the President: "There are no nuclear weapons in South Vietnam. Presidential authority would be required to put them there." This led to LBJ's "angry eruption" over the plan, and within days, Sharp ordered a shutdown. The entire plan was drafted in secret, and was kept from American Marines and other soldiers at Khe Sanh. According to former Senate Foreign Relations Committee Chairman, J. William Fulbright (D-AK), "we were just plain lied to" and that the lies had resulted in the loss of "a form of democracy," according to the transcripts.